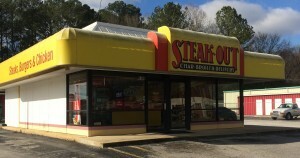 We are proud to bring the Steak-Out grill from its founding location in Huntsville, down the road to the beautiful community of Athens, Alabama. Our team at Steak-Out is dedicated to delivering top quality food and service to the Athens area & we’re excited to announce that we’re moving to a larger building next door this Spring! Choose from a variety of quality steak cuts, for which the restaurant is named, or other grilled favorites like chicken and shrimp. Be sure to save some room for our moist, creamy NY Style Cheesecake. Call or place your order online and Steak-Out Athens will deliver a hot, fresh meal directly to your door.